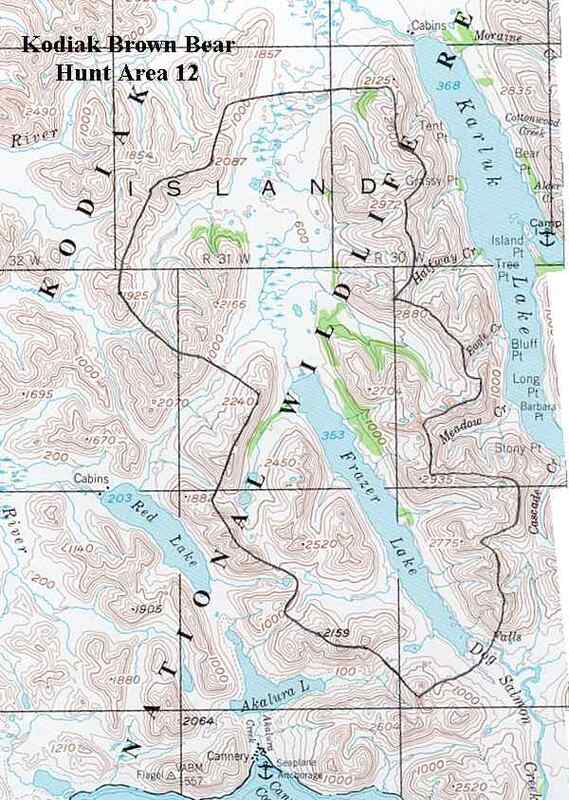 Southwestern Kodiak Island, includes Frazer Lake and its tributaries. See area map (Image file 86 kB). Mountainous terrain intersected with numerous drainages, with alder and willow thickets extending up to 1500' in elevation around Frazer Lake. Primarily tundra and grassland vegetation interspersed with alder and willow thickets along the upper Pinnel Creek drainage to the north. Kodiak National Wildlife Refuge manages all of the lands within this area. Two Kodiak National Wildlife Refuge cabins are located on Frazer Lake. One is on the north end, and other is on the southwest end.